You may have heard about living trusts but are unsure of the difference between a trust and a will. You may also question whether or not you need a living trust. A living trust is a legal document which is created by you during your lifetime. In the same way a will does, a living trust says exactly what you would like to happen to your property and assets and what will go to whom. The largest difference between a living trust and a will is that a will becomes effective only after you pass away and after it has been entered into probate. A living trust can bypass the process of probate, which can often be costly and time-consuming. This enables your trustee to carry out any instructions that you have left in your living trust at the time of your death, as well as if you are notable to manage other assets of life due to incapacity, such as finances, healthcare, and legal affairs. If you have complex financial or personal circumstances, you may want to consider contacting an attorney to develop a living trust. Complex situations where you may want to contact a lawyer include substantial assets, a blended family, closely held business interests, or property in other states. For example, 75% of all marriages in California end up in divorce. When you become remarried and there are children involved from a pre-existing marriage, for blended families or second marriages, it's important to be careful regarding dispositive provision – an experienced California estate planning attorney can help with this. Your lawyer can also help you understand and decide on which is right for your personal situation – a revocable living trust or an irrevocable living trust. A revocable living trust allows you to transfer your assets into the ownership of the trust. You get to control these assets as the trustee and you can revoke the trust or change it whenever you please. The assets will pass directly to your beneficiaries without the time-consuming and expensive probate process when you pass away. 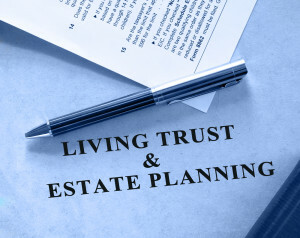 These trusts do not avoid or minimize estate taxes. An irrevocable living trust allows you to give away your assets during your lifetime and just as the title suggests, is irrevocable. Once you have given away your assets, you no longer have any control of these assets. They are no longer considered part of your estate and aren't subject to estate taxes, as those of a revocable living trust are. This will is appropriate in only the rarest circumstances. There are many benefits to having a living trust including the ability to control the distribution of your assets after death and direct your estate aspects to those you love. You may also avoid unnecessary federal estate tax while providing an orderly distribution of your estate after death during an already difficult time for your loved ones. Contact a California estate planning attorney today.